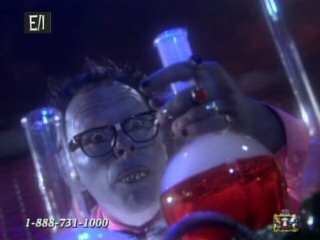 way back in november when i first posted about bibleman, i promised to write more about the apparent antisemitism in the show. now that my situation has changed, i have more time to get around to such things. that first post was pretty light and, dare i say, a bit obsessive. this will naturally be a bit more serious, considering the subject matter. i'm hardly the first person to notice an antisemitic vibe to the show. 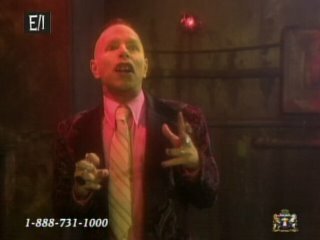 last june, station manager ken at WFMU's beware of the blog browsed through the trailers on the bibleman site and concluded that many of the villains are meant to be subtly gay or jewish. for the sake of this discussion, i'm not interested in some of the villains ken lists here—particularly the villains played by brian lemmons, who are often effeminate but don't scream "jewish stereotype" to me as much as the wacky protestor, sammy davey, or the gossip queen. 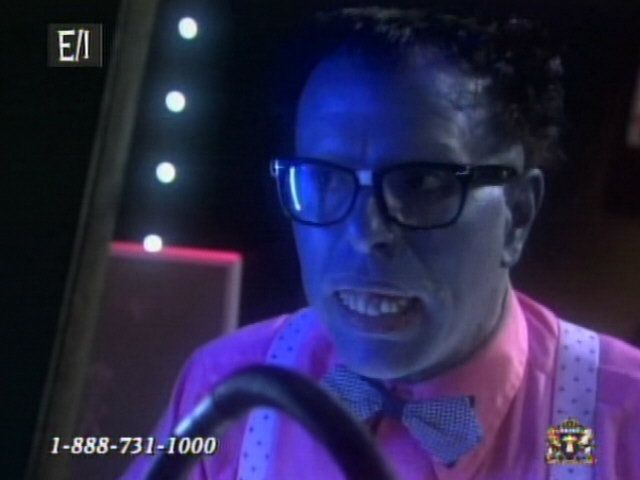 Anyway, Bibleman's nemesis The Wacky Protestor came out, and was the SPITTING image of Jerry Lewis from the movie The Nutty Professor, a blatant copy. He played the stereotypical buck-toothed, gangly Jewish geek. I know. Hmmmm. Seriously, THAT was the villian? Some geeky obviously Jewish stereotype? The villian minced and practically oy-veyed around and then went into some vaudvillesque Buddy Ebson song and dance routine. I absolutely could not believe my eyes. The Wacky Protester hates Christians and hates the Bible. That was the plot. Not-Willie-Aames spewed scripture, they drew out swords, and Bibleman won. The end. The whole thing took an hour. I had to wonder what the deeper message was. Did the Bibleman people intend this to be rather anti-semetic? Maybe I am just hypersensitive, but to me, it sure felt that way. It isn't that I don't have a sense of humor or anything, but please. I can only imagine what the anti- defamation league would say, if they got a load of this show. Thank you for attending our latest Bibleman Live Adventure. My name is Jef Scott. 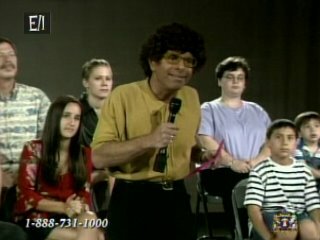 I portray the Wacky Protestor in the Bibleman episodes, as well as the voice in the live show. You are correct, in that the Wacky Protestor is a carbon copy of Jerry Lewis' character, The Nutty Professor. I have been a Jerry Lewis fan for my whole life and have studied his style of film making extensively. Knowing the boundaries we must keep in check while we produce the Bibleman episodes, I am very conscious of the villain's actions. The Nutty Professor film makes absolutely no mention of him being a person of the Jewish faith. It is true that Jerry Lewis is of the Jewish faith, but not this particular character he portrays. Our intention is using this character is to create a conflict that can have a positive message and solution, sending the importance of Jesus Christ's Word to our children, as well as adults. We design the episodes to have many levels, so that a family can watch together and (hopefully) be entertained on these many levels. Again, we appreciate your support and understand that our privilege, is to serve Jesus Christ. What he doesn't understand is while it is okay for a minority to make fun of their own given stereotype (a la Chris Rock or Jerry Lewis for example), it isn't really tasteful or PC for a fundamentalist Christian to imitate Jerry Lewis doing a parody on geeky jews-then take it to the next level and villianize him. I don't care what he says, The Nutty Professor is a very in-your-face Jewish stereotype, created by a master Jewish comedian. The fact that Jerry Lewis just so-happens-to be-Jewish, is not an accident Jef, Jeff, whoever you are. i might have been willing to accept jef's explanation: that he's just a huge jerry lewis fan, and naively didn't notice that the nutty professor plays on jewish stereotypes. i might have believed that he just didn't realize that his characters could be seen as demonizing jews and that it was all a big misunderstanding. but then i realized that jef scott is also the actor who played sammy davey. i want to tell you about sammy davey; that's the whole reason i wanted to write this post. but to do so properly, i first need to briefly discuss another one of jef scott's characters, primordius drool (seen in picture #3 here). drool devises a complicated plan: he will unleash a wave of attacks on the city. his intention is to trick the townspeople into putting all of their faith into bibleman rather than into god. because bibleman is not god, he will inevitably fail them, and the people will lose faith in both bibleman and god. the logic here is a bit peculiar, but typical for the show. and of course, drool's plan works... for awhile. during the height of the crime wave, people are pissed at bibleman. desperate to save his image, bibleman goes on a daytime talk show to defend himself. the crowd and the host are hostile, to put it mildly. 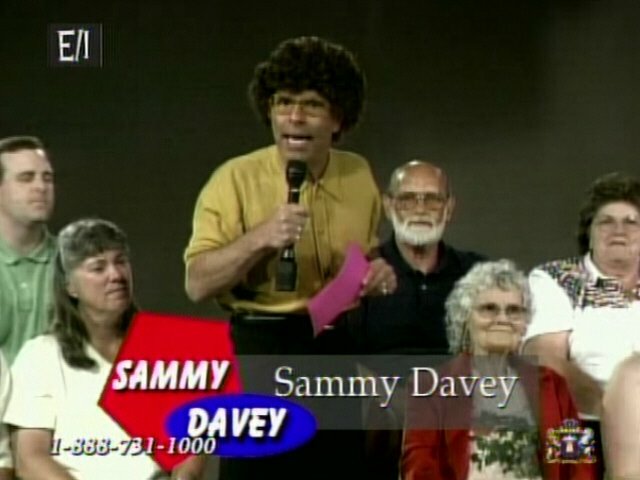 the host's name is sammy davey. and he's perhaps the most flagrant stereotype of a new york jew i've ever seen on tv. let's start with his name: sammy davey, an obvious reference to sammy davis, jr, a flambouyant entertainer known for converting to judaism. he's also a somewhat sleazy daytime talk show host, which is itself a profession where jews have risen to prominence (see maury, jerry, sally jessy, etc). but that's just the beginning. take a look at sammy himself, as seen in pictures 4 and 5. note the enormous afro of curly black hair and the thick-rimmed glasses, reminiscent of gene shalit. and look at his posture, the way he slumps and sneers and smirks. if all that wasn't enough, what really gets to me is his voice: he has the accent you'd think he would, the classic stereotypical new york jewish accent. but it's not just that he has an accent (as riffraff1138 points out on wikipedia's bibleman talk page, the evil AI LUCI has had an accent like this for years). anyone remotely familiar with american superheroes would know that the proper pronunciation of bibleman is "bible man": he's a man with bible powers. but sammy davey repeatedly pronounces it "biblemun", like a jewish surname. but i'll do you the next best thing, and provide some audio highlights from the showdown. i've cut out bibleman's answers, as the whole sequence in pretty long; this edited version is almost 2 minutes. listen to the audio and look at the pictures of sammy davey and tell me that this character is not a blatant stereotype. I am glad I was searching the internet for Bible Man's next tour date. My young son could have easily looked himself... and he would could have found this horrible comment! Christian or Jewish Faith have some decent consideration and self control of your tongue!!! boohoo i am so glad i do not have to be a superhero like BibleMan has to. I'am so glad i do not have to be a superhero like BibleMan has to. Please....at the end of the day, it's entertainment. I have never read such crap in my life. If you are a "true" believer, you will see the value, through the entertainment. I own the videos. My kids enjoy watching them. I am a believer in Jesus . How quick we are to pick apart things we don't agree with. According to the Bible, salvation is of the jews. Jesus was jewish. We christians would still be dead in our sins if it weren't for the JEWS. I think you are being hypersensitive and a tad foolish. Any Christian worth his salt knows the biblical truths about the jews. jeeze, I would pray that the people who posted this rot would find Jesus and read His Word! I think the problem here is not so much its obvious anti-semitism, but the underlying messages of the entire show. Its nothing more than an attempt by the extreme right to instill their own warped ideas. Anti-semitism is only one of the major issues this program has. Personally I would never allow my daughter to watched this skewed crap. 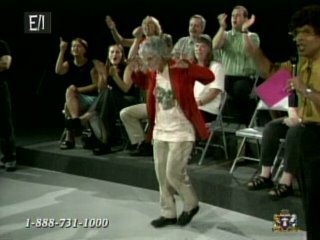 if God is with these people and wants to use this "Bible Man" show for any reason, you won't be able to shut it down. if God isn't with these people they will fall on their own. Me and my brother are looking for the lyrics to Bibleman songs, with no luck. can anyone help us out. it would be much apresiated. A wise and follish man our fighting(arguing). who then is the wise man? These shows teach kids to somehow "battle" these other kids who happen to look different or be smart, and they do. If these shows wanted to create situations that are more like the real world, the villains wouldn't be "ugly", they would look just like Bible-man or other "trust worthy" looking people. Remember kids, people of different faiths are evil! Good lord. This whole article is exactly what is wrong with society these days. You HAVE to find SOMETHING to be offended by. Always. You cannot take the show and its message at face value, focusing on the purpose of the production rather than the small, irrelevant details that are likely lost on every child who watches this. No kid is going to turn on Bibleman and be outraged at apparent antisemitism. They're going to absorb the message provided and, hopefully, take it to heart. Quit trying to complicate and distort this show with view that are far-fetched, if not completely irrelevant. No one cares anymore about whether someone is Jewish. Stop acting like the world is still out to smother you. lol.. Yeah, really encouraging. You don't sound any different than the psychotic extremist Muslims in the Middle East. Plan on flying any time soon? Idiot.